Anthony Bourdain dedicated an entire chapter of “Medium Raw” to Le Bernardin’s Justo Thomas, the now-almost-legend-like fish butcher carrying out the masterful salmon fillet job described in the excerpt above. Northern Virginia has no Le Bernardin. But the Super H-Mart in Fairfax, VA, has some of the freshest seafood you will find anywhere. Cod, salmon, flounder, catfish, carp, mackerel, hairtail, and more varieties of shellfish than I can recall. Oh, live blue crab and even live crayfish, occasionally. 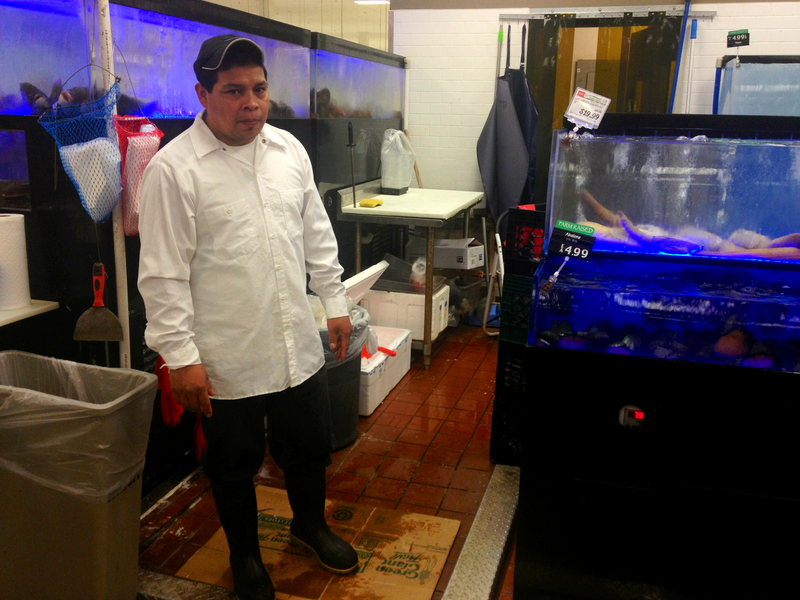 At the fish section’s epicenter is Heradio, master fish butcher. With skills that rival even the most seasoned sushi chefs, hand him a live flounder and he will have it gutted, cleaned, filleted, sliced, and in your mouth before you can say Eric Ripert. I’m satisfied that you just shared this useful info with us. Please stay us up to date like this. Thanks for sharing.